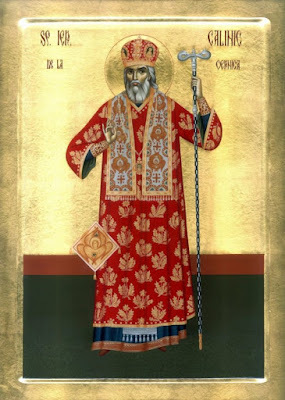 Our holy Father Callinicus (Calinic) of Cernica, who served as bishop of Ramnicu Valcea in Romania was born in Bucharest on October 7, 1787, near the church of Saint Bessarion. His parents, Anthony and Flora (Floarea) Antonescu, were honest and pious people. In holy Baptism he received the name Constantine. Constantine’s mother brought her son to church and taught him his prayers, instilling in him a deep love for the Most Holy Theotokos. When he was old enough, he was sent to school in Bucharest. In addition to the usual subjects taught at that time, he also learned Greek. After raising her children, Flora became a nun in the monastery of Pasarea, and was given the new name Philothea. Her first son became a priest, and later he received the monastic tonsure, taking the name Acacius. It is not surprising that the younger son, Constantine, became attracted to the monastic life and wished to follow their example. On Feast Days, Constantine loved to visit the monastery of Cernica. The igumen at that time was the most devout George, who was a disciple of Saint Paisius Velichkovsky (November 15). The Cernica monastery also followed the Rule of Saint Paisius. In 1807, when he was twenty years old, Constantine left his home and entered the monastery. He was given into the care of Father Pimen, a master woodcarver, and one of the Spiritual Fathers of the monastery. In a short time, Constantine surprised the rest of the monks by the way he fulfilled his monastic obediences, by his prayer and fasting, and by his exceptional love and innate goodness. At his tonsure, he received the new monastic name Callinicus, and was soon esteemed for his love of prayer, his humility, and his balanced spiritual life. Some of the less zealous monks, however, were ashamed when they saw his exceptional fervor. The young monk continued to fulfill his obediences, and amazed the brethren with his purity, knowledge, long-suffering, kindness, and unfeigned love (2 Cor. 6:6-7). Therefore, Father Pimen decided not to wait for the full three years of monastic trial for Constantine. On November 9, 1808, with the blessing of Igumen Timothy, Brother Constantine was tonsured with the name Callinicus. Father Callinicus prayed, fasted, fulfilled all the rules, and permitted himself only three hours of sleep each day. Because of the strictness of his life, and his good example to others, he was ordained to the diaconate on December 3, 1808. He remained under the supervision of Father Pimen, for no one may enter the Kingdom of Heaven without obedience. Hierodeacon Callinicus, because of the strictness of his life, soon attracted the notice of Igumen Timothy. In 1813, after many of the priests at the monastery had died from cholera, Deacon Callinicus was found worthy of the holy priesthood. His ordination took place on February 4, 1813. Though at twenty-six he was younger than most of the other monks, they respected his wisdom and asked him to become their Confessor and Spiritual Father. 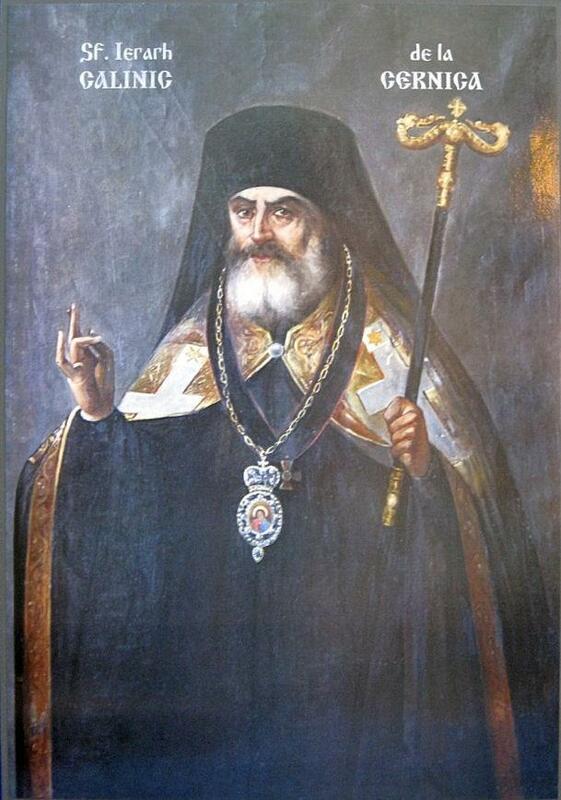 So it was that on September 20, 1815 Metropolitan Nectarius himself made him the Spiritual Father of the monastery. So great were his spiritual qualities that many people came to him for Confession, not only monks and laymen from various lands, but even the Metropolitan himself. They all found in him the consolation and tenderness of God. Since the humble Callinicus knew the monastery’s rules so well, Igumen Timothy also made him the Ecclesiarch. Elder Timothy reposed on March 3, 1816, departing this life with his soul at peace. He had built a large church on the island of Saint Nicholas, and dedicated it to that saint. Although the work of painting icons in the church was only half finished, he knew that others would complete the work he had begun. Saint Callinicus took part in this work himself. In 1812 he and his Spiritual Father Pimen went to Moldavia looking for help. Upon their return, Father Pimen went to the Holy Mountain for greater tranquility. Saint Callinicus found himself under obedience to Father Dorotheus, who was elected to replace Father Timothy as Igumen in 1816. Since Father Dorotheus was quite old, most of the cares of the monastery rested on the shoulders of Saint Callinicus. These responsibilities did not interfere with his work of enlightening his own soul, however. 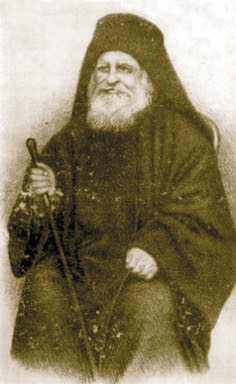 In 1817, Father Dorotheus, feeling that his end was near, sent Saint Callincus and the monk Dionysius (who spoke Turkish) to bring Father Pimen back from Mount Athos so that he could replace him as igumen. Saint Callinicus was happy to undertake this journey. Arriving on the Holy Mountain, Saint Callinicus and Father Pimen visited many of the monasteries there, observing the life of the monks. He learned many things which he later applied when he was the igumen of the monastery, and even as bishop. He listened to the counsels of the Athonite monks, both the learned and those who were humble. After helping the monasteries with whatever they had, they celebrated the Feast of the Dormition of the Theotokos. Then Saint Callinicus and Father Pimen returned to Romania in 1818. When they got to Cernica, they found Father Dorotheus still alive, and he told Father Pimen to take his place. The Lord, however, decreed otherwise. The ever-memorable Father Dorotheus fell asleep in the Lord on December 13, 1818. On the following day, the monks of Cernica elected Saint Callinicus as the next igumen. Father Pimen was not saddened by this at all. He remained as the Spiritual Father of Saint Callinicus, and until his death he continued to advise and to love his former disciple. Father Pimen was placed in charge of the monastery’s vestments, and of all the monastery’s business. He introduced some new rules to Cernica, which were similar to those he found on Mount Athos. The monks of Cernica found these rules very difficult to follow. Perhaps that is the reason why Saint Callinicus was chosen as igumen, rather than Father Pimen. Eleven years had passed since the saint entered the monastery, and now he was thirty years old. In less than two years he had completed the iconography work in the church of Saint Nicholas on the island. He also finished the exterior of the church, and furnished it with everything needful. 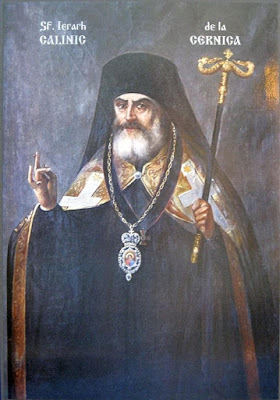 Seeing the zeal which Saint Callinicus had for God’s house, Metropolitan Dionysius Lupu raised him to the rank of Archimandrite. The saint fulfilled his responsibilities as igumen with great fervor, though he knew what a difficult task it was to govern men. He believed that the igumen should be “the heart of all hearts who seek him or ask him for instruction or consolation. He is the path to perfection for all the believing souls around him. Just as Saints Anthony the Great (January 17), Pachomius (May 15) and Macarius (Jan. 19) were responsible for many monasteries in the desert of Egypt, so was Saint Callinicus responsible for several monasteries and sketes in addition to his own: the monasteries of Pasarea, Tiganesti, Caldarusani, and the Sketes of Saint John of Tigia, Poiana Marului, Ratesti, and Ciorogirla. The parish churches at Campina, Ghenoaia, and Tohani Buzaului were also under his authority. In the latter church, it was the prerogative of the Spiritual Father of Cernica to choose the chief priest. Saint Callinicus was the igumen of Cernica during difficult times. In March of 1821 the uprising of Tudor Vladimirescu began. After this, the Turks attacked the country, and many of the citizens of Bucharest sought shelter in the monastery of Cernica. 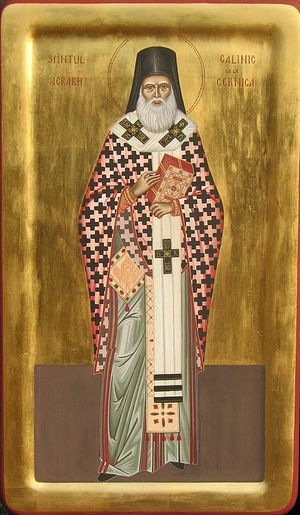 Saint Callinicus received everyone with paternal love, hiding them in the cells of the church of Saint Nicholas. At this time he sent monks to the island of Saint George. On May 15 of the same year, the Turks came to the town of Catsela, which was close to the monastery. Someone informed the Turks that some rebels were hiding in the monastery. The Turks surrounded the buildings and placed cannons everywhere, intending to raze the monastery. Learning of this danger, Saint Callinicus assembled the people and the monks in the church. After encouraging them, he prayed all night in the church with them, asking that they and the monastery might be spared. The next day he sent a monk to the Pasha at Catsela to assure him that there were only simple folk from Bucharest with women and children in the monastery. The Pasha changed his mind, and sent soldiers to protect the monastery from danger. The supply of food for those staying in the monastery began to run low, but the monks had no more provisions. Deeply saddened, Saint Callinicus prostrated himself in front of an icon of the Most Holy Theotokos and Saint Nicholas, and prayed for assistance. When he finished praying, a miracle took place. Five carts loaded with bread and drawn by two bulls came through the monastery gates. Another Pasha came to the monastery of Pasarea in the village of Panteleimon, and kidnapped one of the nuns. Saint Callinicus moved the rest of the nuns from Pasarea to the monastery of Snagov for their safety. He then wrote a letter of protest to the governor, who ordered the Pasha to release the nun. The Pasha swore that he would destroy the monastery of Cernica and take revenge upon Saint Callinicus. Once again, the saint learned of the Pasha’s intentions, and he prayed all night long with his clergy for the monastery to be spared. At midnight, the Pasha was prepared to attack the monastery, but first he asked for a cup of coffee. A servant handed him the coffee, and as he did so, he shot the Pasha. The bullet struck the bag of gold coins which he wore under his shirt, and so he was not killed. In gratitude for his deliverance, he sent the gold to Saint Callinicus saying that it should be used to build a well for the monastery. Fearing some sort of trickery, the saint told the Turks, “If you wish, and if you are telling the truth, then you yourselves should build the well next to the bridge.” Workmen built the well on the north shore of Saint George’s Island, and it is known as the Well of the Turk, to this very day. On another occasion, the monastery cook told Saint Callinicus that they had no more flour. He replied, “Let us place our hope in the Mother of God and in Saint Nicholas, and we shall want for nothing.” The saint went to his cell to pray before the holy icons, asking Saint Nicholas to help them. A miracle took place that evening after Vespers. A cart with two drivers came to the monastery with a load of flour. They asked Father Charalampus, the ecclesiarch, where to unload the flour which their master had sent as a gift. When the monk asked for the name of their master, they said that he wished to remain anonymous. Saint Callinicus served a Molieben of Thanksgiving to Saint Nicholas, and then went to bless the flour, which was used to bake bread for the consolation of the brethren. After Matins one morning in July of 1829, Saint Callinicus was in his cell reading the Life of Saint Nicholas. When he got to the sixth chapter, he fell asleep from weariness after the all-night Vigil. Suddenly, Saint George appeared in his armor and Saint Nicholas in the vestments of a bishop. Behind them was Father George, the late igumen of Cernica. “Arise,” said Saint Nicholas, “and on this island build a church dedicated to the Holy Great Martyr George.” Saint George told him, “We will send you everything that you require.” Then Igumen George said, “Do not doubt in your heart.” They departed after saying these things. At that time there were only a few cells on Saint George’s Island, among them was the cell of the late Igumen George, where Father Pimen had now taken up his residence. There was also a small church dedicated to Saint George, a gift from Bratovian. Next to this, Saint Callinicus built a large and beautiful church. In time, the words of Saint George were fulfilled, and indeed all that was necessary was provided. Several years after the uprising of Tudor Vladimirescu, a certain Romanian noble made a secret agreement to banish the Phanariots from the country and to choose a Romanian king. They collected money and other necessities for this purpose. The funds were to be held by Bishop Ioannicius, who lived in Bucharest. The nobles told him that if their plan failed, and if they had to flee the country, that the money should be used to build a church. The holy bishop also contributed some of his own money to this sum. In 1831, during an outbreak of cholera, Bishop Ioannicius came to Cernica and entrusted all the money to Saint Callinicus. The building of the church had already begun in 1823. It was completed in 1836 and consecrated that year on the Feast of the Transfiguration (Aug. 6). In January of 1838, the church was destroyed by a great earthquake. The saint restored it and built cells nearby, surrounding the buildings with strong walls. This work was completed in 1842. In 1846, he began construction of a church at the Skete of Pasarea, which was consecrated the following year. Saint Callinicus also built a church in Buesti on the Baragan River, and he built stone houses in the village for the overseers. He also built barns for Cernica Monastery’s animals. Many people were surprised when he tilled the land and planted willow trees in the middle of the field. Several times when Alexander Ghica was governor, Saint Callinicus was selected to become Metropolitan, but he always declined. He had no wish to leave the monastery where he had labored for so many years. About this time, someone in the monastery poisoned the saint. The brethren of the monastery were much saddened by this evil deed. Since he was near death, he advised the monks to select someone to replace him as Igumen. They chose the most devout Benjamin Katulos. At once, he felt himself to be completely well. He got up and went into the church, where the monks were chanting the midnight service. They were amazed to see him fully recovered and standing in his usual place. They went to his cell after the service to ask him how he had become well all of a sudden. He shared with them everything that the voice had told him. They all rejoiced, giving glory to God. The assigned governor of Romania, Barbu Demetrius Stirbei had just returned from the Sublime Porte (this was the official name of the gate leading to a block of buildings in Constantinople which housed government offices). He was an intelligent man and a good ruler. As such, he decided to put the Church’s affairs in order, as well. So he had bishops elected to fill sees which were vacant. 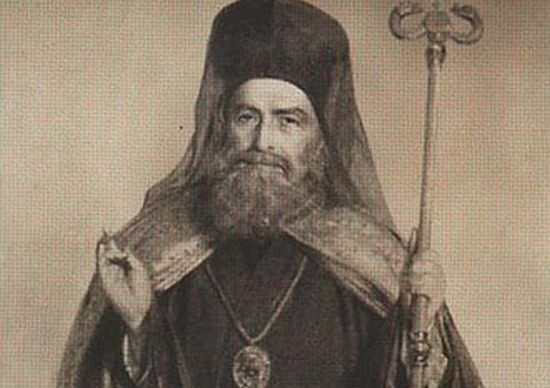 Saint Callinicus was elected Bishop of Ramnicu Valcea (a city located north and west of Bucharest) on September 14, 1850, and only with great reluctance did he accept the position. He accepted only because he did not wish to make the sovereign sad. Since he would have to leave his monastery in order to fulfill the responsibilities of a bishop, the monks elected Archimandrite Nikander to replace him. The monks loved their Spiritual Father who had guided them on the path to salvation by his words and by his example. When he left Cernica, the great bell was rung until everyone had gathered in the church to bid the saint farewell. There were about 350 monks in the monastery at that time, and even those who were ill got up from their beds in order to receive his blessing one last time. Saint Callinicus entered the church and read the Prayer of Forgiveness, asking them to maintain the rules of the Church and of the monastery. When the service had concluded, everyone left and went outside and walked to the waiting carriage, to the sound of the monastery’s bells. Many were weeping, and even the hardest hearts were softened. Saint Callinicus took several monks with him so that they might assist at the Divine Services in the diocese. In this manner the saint left the monastery of Cernica where he had lived for almost 43 years, serving as Igumen for 32 of those years. As the carriage bore him away, Saint Callinicus looked out the window at the domes of the monastery’s two churches. As he remembered his life in this place, his eyes filled with tears. Ramnicu Valcea, the see of the diocese, was in Craiova, the capital of the province of Olteni. During the long journey, he would stop at several towns and villages, where the people greeted him with the traditional bread and salt. At Craiova the church bells rang, and many people sang songs written in his honor. So many people came to see him that the church of the holy Great Martyr Demetrius could not contain them all. Prayers were offered for the new bishop’s health, and official representatives of the city’s clergy and lay leaders congratulated him and wished him success in his archpastoral ministry. Saint Callinicus began his work the next day, visiting churches and monasteries, and correcting those things that were not according to the proper order of the Church. His door was always open to the poor and downtrodden, and he taught his flock by word and by personal example. Things continued in this way until 1854 when war broke out between Russia and the Turks. These were also difficult times for Romania, because the Turks entered the province of Olteni on July 18. 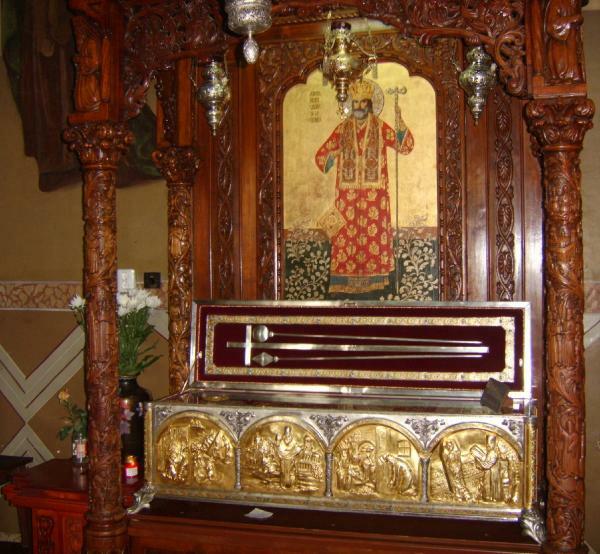 Even though Saint Callinicus had been ordered to return to Bucharest with his clergy and staff, he went instead to Ramnicu Valcea, the former See of the diocese. The church and its surrounding buildings had been damaged when a fire broke out there on March 27, 1847. Saint Callinicus was able to restore everything in two years. The holy bishop was also a writer. He composed a “Lamentation,” various poems, and an “Instruction” for monks, in addition to a Chronicle of the events of 1821. At the same time that the See was returned to Ramnicu Valcea from Craiova, Saint Callinicus set up a printing press so that he could print service books for the churches, and spiritual books for the benefit of the faithful. Saint Callinicus once made the body of a person who was long dead turn to dust. In the summer of 1854 he went up the river Valea Jiului to the skete of Lainici. Many of the faithful from all the villages came out to receive his blessing. Among these were the sons of a certain wealthy man who had died some time before. They asked the bishop to stay in their home that night, because the next day was a Saturday and they wanted him to serve a Memorial Service for their father. The saint agreed to stay at their home that night. With great sadness they told him that their father had reposed a long time before, but that his body had not yet turned to dust. They opened his grave three times, and had bishops and priests conduct Memorial Services for him. Since the body still had not decayed, they thought that some sort of curse had been placed on him. The next day Saint Callinicus served the Divine Liturgy in the village church, then went to the man’s grave, which had been opened for the fourth time. The body was taken from the grave and placed by the church wall. All of his clothes looked as if they were new. After the service the bishop read the prayer of forgiveness of all sins. As he was reading, the body began turning to dust, starting with the feet. When the prayer was finished, nothing was left of the body but a pile of dust and some white bones. Those present began to glorify God, Who had endowed Bishop Callinicus with such miraculous power. The disciple noted the exact day and time of this conversation. Later, when he went to Bucharest on business, he stopped at Cernica. There he was told that Elder Nikander had indeed reposed on the very day and at the very hour that he had spoken to Saint Callinicus in the mountains. On another occasion, Saint Callinicus healed a woman who had been possessed by a demon. He performed this miracle in one of the churches of Ramnicu Valcea. This took place in the presence of Father Kostako, the Archpriest of that city, Archimandrite Anastasius Baldovin, and the land owner Kostako, who built the Skete of Frasinei and other sketes. Saint Callinicus had just finished serving the Divine Liturgy when he was asked to read a prayer for a woman who was quite ill. Possessed by an evil spirit, she was restrained by four men. Her clothes were tattered and torn, and she screamed and foamed at the mouth. It was only with great difficulty that they brought her to the bishop and had her kneel. The saint read the prayer, blessed her three times and said, “Arise, in the name of our Lord Jesus Christ.” At once the woman got up, completely healed in soul and in body. She bowed before the holy icons and gave thanks to God. She asked for some clothes, since she could not go out in the rags she was wearing. Kostako went back to the bishop to thank him for this miracle. At the gate to his home Kostako met Archimandrite Anastasius Baldovin, who carried a silver reliquary containing the head of the holy Martyr Mercurius (November 24). The monk asked him where he was going. “I am going to thank the bishop, because my son has become well,” he answered. “His Grace has sent me here with the relic of Saint Mercurius so that your son may venerate it,” said Father Anastasius. From that hour the young man was completely well. A certain peasant in the village of Muereasca-Valcea had a daughter who was ill. She could not be brought to the bishop at the nearby Skete of Frasinei because Saint Callinicus did not allow women there. He followed the example of Saint Athanasius of Athos (July 5), who did not permit women to set foot on Mount Athos, the Garden of the All-Holy Theotokos. No one disobeyed the order, because the people were afraid to do so. In the summer of 1862 or 1863 a girl from Muereasca unknowingly crossed the boundary line while chasing a cow. She became ill and had fits. Her parents asked the village priest to ask for Saint Callinicus to forgive and heal her. When the bishop heard of this he agreed to go and see the girl. Upon entering the girl’s house, Saint Callinicus found her in bed and in great pain. He asked her, “Do you recognize me?” The afflicted one nodded her head. As he caressed her head the saint told her, “You will become well; yes, you will become well. I have forgiven you; now let us pray to the Lord that He may also forgive you.” He read the Prayer of Forgiveness, and told her again, “Yes, you will be well.” The girl, of course, was healed, and news of the miracle spread throughout the district. Saint Callinicus performed similar miracles during the seventeen years he served as Bishop of Ramnicu Valcea. When he reached the age of 80, he began to feel the approach of death. He had served the Lord for sixty-two years, and he was much weakened by all his labors, and thought that he should retire from his Episcopal duties. He decided to return to the monastery of Cernica, where he wanted to be buried. On May 24, 1867, the saint arrived at the monastery, where he saw some of the monks he had known in his younger days. As he looked around him, he saw many reminders of his earlier accomplishments. There was Saint George’s Island, and the church of Saint George which he had built, and surrounded with strong walls. Everything in this place was dear to him, and it was fitting that he should come here to rest, and also to die. On the second day after his arrival, Saint Callinicus went into the church and prayed for a long time in front of the holy icons. After the service, he gave out prosphora to everyone and gave them his blessing. After this, he returned to his cell, and he never left it again until the end of his life. On the radiant day of Christ’s Resurrection, he asked one of the priests to bring him Holy Communion. After partaking of the Holy Mysteries, he received one of the monks who wanted to obtain his blessing to travel to Ramnicu Valcea, where he was being sent. At five o’clock on the morning of the date specified, the saint asked his disciple Germanus to give him a clean shirt, for several high-ranking individuals had come to bid him farewell. Saint Callinicus also asked that a cross be placed in his hand. He kissed it and said, “Holy Cross, help me.” Placing his head on the breast of Father Germanus, he sighed three times and gave his soul to God. So it came to pass. Seven years later, on May 5, 1875, Metropolitan Niphon reposed. News of the saint’s repose spread quickly to Bucharest, and to other cities and towns. Many people came to Cernica to see the holy bishop for the last time. Saint Callinicus was dressed in the vestments he had received as a gift from Sava Brancoveanu when he was consecrated as bishop. He was brought to the church seated in a chair, holding the Gospel and a staff in his hands. He remained there for two days. On Saturday, April 16, 1868, Metropolitan Niphon arrived at Cernica with four bishops, and chanted the service for the departure of a soul together with all the clergy of the monastery. Afterward, Saint Callinicus was buried in the narthex of the church of Saint George. Saint Callinicus died in poverty, for he gave everything away to widows and orphans, donated funds for the building of churches, and also for other charitable purposes. Though he renounced worldly riches, he had acquired great spiritual treasures during the course of his holy and God-pleasing life. Through the prayers of Saint Callinicus, let us strive to lay up for ourselves similar spiritual treasures, holy and incorruptible, in the Kingdom of Heaven (Matthew 6:19-21). Amen.